Iron Maiden The Soundhouse Tapes 7" set of 7 colors plus a white label black vinyl testpress (only a handfull made of this!). Official Reissue from the UK, pressed in RED Vinyl. STILL SEALED! IRON MAIDEN. UK / 2002 / EMI / 7243 5 50623 7. Vinyl: UNPLAYED / SEALED. Here we go with the. Cover: SEALED / PERFECT. Uncle Acid & the Deadbeats - 7" - PURPLE - sealed new copy. A Pusher Man. iron maiden cover. A1 Out Of The Silent Planet. THIS IS A REAL OFFICIAL / GENUINE 2000 Made in UK 1st Press PICTURE DISC. Bruce Dickinson - lead vocals. B1 Wasted Years (record live on the Ed Hunter Tour 1999). 2000 EMI RECORDS Ltd., UK 12EM 576. IRON MAIDEN. 1982 UK EMI RECORDS 5287. 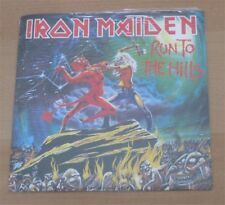 ORIGINAL UK PRESSING ON RED VINYL WITH PICTURE SLEEVE. RECORD IS VG . BUY MORE AND SAVE. If original sleeve is pictured it is included. IRON MAIDEN. 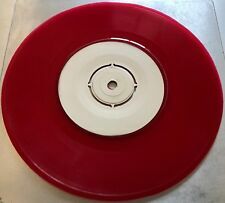 UNIQUE 7" TEST PRESSING COLOURED, RED VINYL. "NUMBER OF THE BEAST". CONDITION: VINYL: STRONG VG (SUPERFICIAL MARKS, SCRATCHES - SIGNS OF AGE & STORAGE WEAR) / LABEL: EX- (CLEAN, UNMARKED) / SLEEVE (GENERIC): EX. The Clairvoyant / The Prisoner (live). IRON MAIDEN. 1988 UK EMI RECORDS EMS 79. If original sleeve is pictured it is included. All singles are sent in Japanese style mylar-lite resealable crystal clear sleeves. IRON MAIDEN WITH STRANGER IN A STRANGE LAND FROM 1986 ON A STUNNING PICTURE DISC VINYL. THE ORIGINAL POLY SLEEVE IS IN EXCELLENT ORDER.THE VINYL IS NR MINT. HAS A FANTASTIC DEEP SHINE TO IT AND PLAYS THROUGH SUPERB.A STUNNER 😁. Vinyl and sleeve in near mint condition. Iron Maiden ‎–Fear Of The Dark - Live Vinyl, 7", Shape, Limited Edition, Numbered, Picture Disc 1993. Vinyl, 7", Shape, Limited Edition, Numbered, Picture Disc. Lots of rare picture discs! Shoot All The Clowns. Bruce Dickinson. EMI Records. ORIGINAL 1994 UK 1st PRESSING. - stickered PVC sleeve with insert. LIMITED CLEAR VINYL. -vinyl clean, unplayed! -labels have no writing or stickers. SLEEVE : NM CONDITION SLEEVE CALENDAR POSTER : NM CONDITION VINYL : NM CONDITION CLEAN SHINY RED VINYL ALL THE PHOTOS ARE OF THE ACTUAL ITEM. WE WILL COMBINE POSTAGE ON MULTIPLE PURCHASES- PLEASE REQUEST A COMBINED INVOICE. WE DO POST WORLDWIDE-OVERSEAS BUYERS PLEASE ASK FOR A POSTAGE QUOTE TO AVOID ANY DISAPPOINTMENT. UK 12" Original 1980' Logo Records Limited Edition Blue Vinyl. Iron Maiden Infinite Dreams Single 1989. Plus Limited Flexi Disc. IRON MAIDEN 7" SINGLE. FROM MY OWN COLLECTION, WHICH HAS SAT IN THE LOFT SINCE THE 1990'S WHEN I SOLD MY LAST RECORD PLAYER. 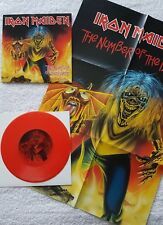 IRON MAIDEN THE NUMBER OF THE BEAST REMEMBER TOMORROW 7" RED COLOURED VINYL 45 ✅. Condition is Used. Dispatched with Royal Mail 2nd Class Large Letter.